Today we’re looking at how the ZenPad 8.0 series compares to the Samsung Galaxy Tab 4 (8.0) tablet. This looks to be a close contest! Let’s first look at the displays. Both of these tablets have a 1280 x 800 resolution. Asus does use the Tru2Life Technology to brighten up the contrast and detail, but until these tablets are compared side-by-side, we will case this a dry. Under the hood, the ZenPad Z380C has a 1.2GHz x3-3200 quad-core processor (64-bit) and the ZenPad Z380KL has a Qualcomm MSM8929. The Galaxy Tab 4 (8.0) has a 1.2GHz quad-core processor under the hood. RAM is pretty much a tie, with the Tab 4 (8.0) with 1.5GB RAM and the ZenPad 8.0 having range from 1GB to 2GB. You will have to check your country and models to see whether you’re at 1GB or 2GB RAM. Overall, under the hood, these tablets are almost the same. No true winner is our verdict. As with all the ZenPads, they feature front facing speakers. The ZenPad 8 has DTS HD Premium sound and the Galaxy Tab 4 (8.0) features a rear mounted speaker. Even though we can’t do a side-by-side comparison at the moment, we think you would agree that front facing is going to be better than a rear mounted speaker. Pointing a speaker away from your listening position seems counter intuitive. An interesting comparison is in the build specs. Weight wise, the ZenPad 8.0 models both weigh 350g and the Galaxy Tab 8.0 weighs in at 320g. There is an outright spec win for Samsung! Next we look at which tablet is thicker. The Galaxy Tab 4 (8.0) is 7.9mm and the ZenPad 8.0 are both 8.5mm. Another win for Samsung! Battery life is one important spec/detail that unfortunately we can’t quite tackle at this time. In general Samsung mobile devices enjoy impressive battery life. It would be a surprise is Asus could beat out Samsung in the battery life department, but for now we will reserve judgement or a final verdict until some have been reviewed online. If you care about tablet cameras, it appears that the ZenPad 8.0 series beats out the Tab 4 (8.0) in both front and rear megapixel counts. Of course MP isn’t everything, but it’s a substantial factor to be sure. The ZenPad has either a 2MP or a .3MP front camera with a 5 MP rear camera. The Galaxy Tab 4 is sporting a 1.3MP front and 3MP rear camera. Specs wise the ZenPad has slightly better, albeit confusing camera specs depending on the model, mega pixel count. Storage size is a bit interesting. The Galaxy Tab 4 (8.0) has just a 16GB configuration. The ZenPad 8.0 tablets have either 8GB or 16GB configurations. Both Samsung and Asus tablets have microsd slots for up to 64GB cards max capacity. 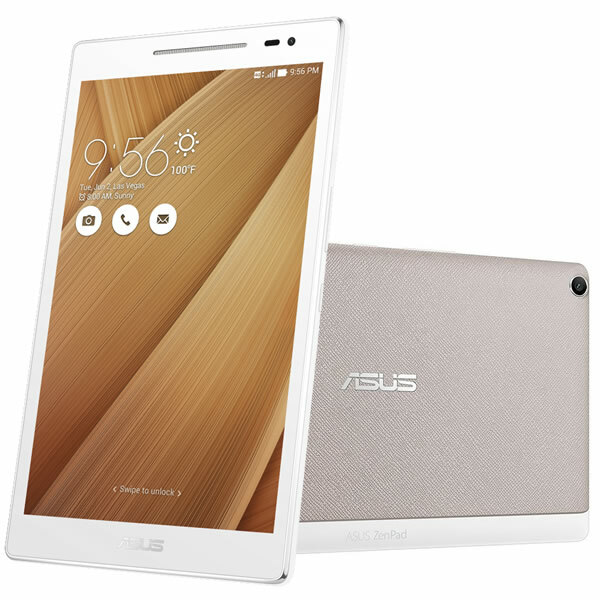 It’s also worth noting that the ZenPads offer a lifetime of free 5GB Asus online storage. We would have to give Asus the slight edge just because of the variations available and the 5GB lifetime storage. It’s pretty much a draw though. In terms of value added, let’s look at features and specs that either tablet has and the other doesn’t. Starting with the ZenPad 8.0, there is the option of buying a 4G LTE model, the Z380KL. The Galaxy Tab 4 (8.0) does not have that option. Not a major point, but worthy of a mention. Next the ZenPad 8.0 has the interchangeable design which means you can add a case or cover that snaps into place, matching the style and adding less bulk to the tablet. You can obviously get a vast array of cases and covers for the Galaxy Tab 4 (8.0) but the matching design and snap into place accessories for the ZenPad 8.0 are still a nicer option overall. This wouldn’t be a deal breaker for a lot of you I’m sure. The Galaxy Tab 4 does have an IR Blaster which means that it can double as a remote control. That’s pretty cool and would be quite useful in a lot of home entertainment environments. Price is going to be a big consideration in who wins out in this comparison. Samsung are known for more expensive devices that Asus and we expect the ZenPad 8.0 models to be equal to or lower than the Galaxy Tab 4 (8.0) prices. The ZenPad is newer which means it will come to market with a potentially bigger price, but we simply don’t expect Asus to price it more than the comparable Tab 4. When you break it all down, these tablets are similar. The build size of Samsung is better than the ZenPad in terms of weight and thickness. That can be important for a lot of you. Battery life is another key comparison which we cannot accurately gauge right now. We will update with the final details which should help up provide a definitive winner. On thing you didn’t mention about storage, ASUS is offering 100 GB google drive storage for 2 years. I don’t know about Samsung. Also, processor comparison….poor Samsung =( you can run a simple benchmark on both devices and you will notice the difference. and still (at least in Portugal) Z380C is less expensive.